If your website or blog has a native browser extension which shows the latest posts it will be a big advantage to your website. So, here you can create a browser extension for free. It will show your latest posts in user’s browser from the RSS feeds. It works on Internet Explorer 8+, Google Chrome 5+, Safari 5+ and Mozilla Firefox 3+ browser versions and Windows XP, Vista, Windows 7, Mac OS X and various Linux distributions. It will also offer real-time content notifications. It will grow your traffic by creating new content channels. How to create the extension. 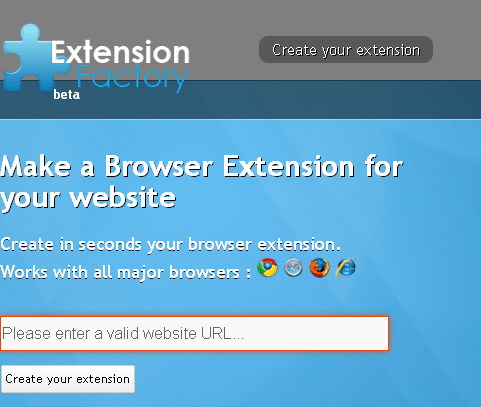 Step 1: Go to The Extension Factory by clicking this link. Step 2: Type your URL on the box and press “Create your extension”. Step 3: Once you have done you can press “Test the extension” and test your newly created extension. Step 4: Copy and paste the given code to your website and it will lead your users to install the extension according to their browsers.